W = Wath Road roundabout, B = Broomhill roundabout - see directions. Alternative parking for large vehicles, motorhomes, etc, ignore left turn to Golf Club, continue 200 m and turn right just before traffic lights for pedestrian crossing. There is a large ungated car park. Walk to Event Centre by crossing road at crossing and following cycle path to the left. At unpaved road, turn right towards MWBC. Routes from the NE and NW use the A6195 Dearne Valley Link Road from M1 (J36) to the A635 from A1(M) (J37). Enter postcode S63 7BU (adjacent golf club) for your in-car Sat-Nav system. 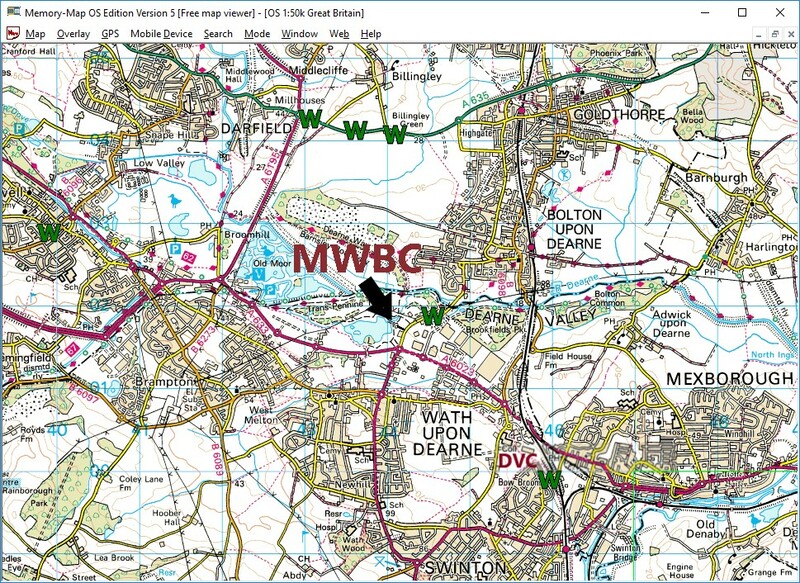 The Event Centre is at MWBC, at the tip of the maroon arrow. The track from the public road is shown as a black line. The W to the NE shows the alternative parking, possible overnight parking for a motorhome.